Join the many merchants, artisans, musicians, and gardeners who will gather to celebrate the arrival of spring! 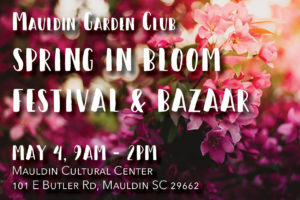 The Mauldin Garden Club will host Spring in Bloom Festival and Bazaar on May 4th from 9AM – 2PM. Visit their website for more details.